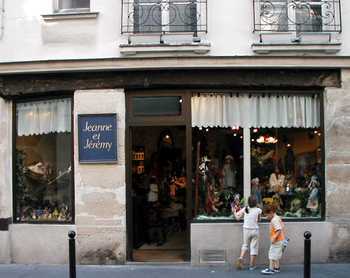 Two kids stop to admire a doll shop window in the 5th arrondissement. 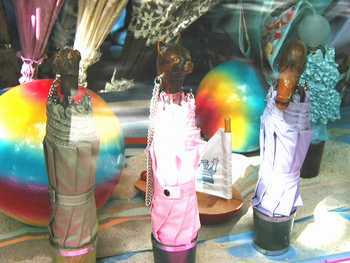 Carved wooden animal heads on umbrellas at the parapluie shop on Blvd. Saint Germain. 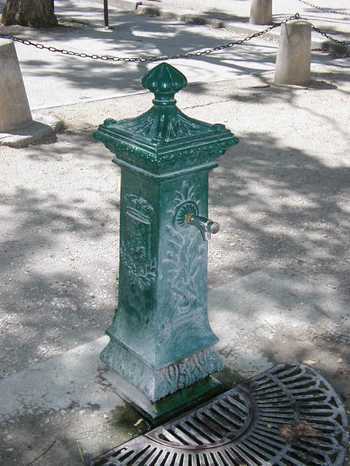 Water fonts like this, found in many Paris parks, were extraordinarily important to us during last summer’s heat wave. Hotel Home Latin, one of the settings for French in Action. You never know what you’ll see in a Paris shop window. 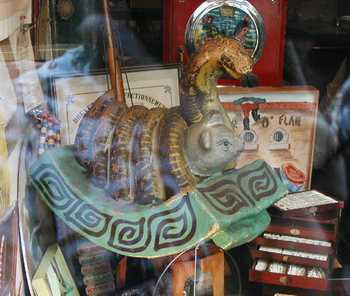 General Burnside would be appalled at this wooden carving of a snake wrapped around a cat (at left). One of the things I look forward to each summer in Paris is chocolate. I don’t like sweet chocolate very much. My favorite is 86% pure dark chocolate. Generally, I buy the Poulain gold-wrapped 1848 86% chocolate bars, right from the grocery store. There are wonderful looking chocolate shops everywhere, but they generally have sweeter chocolates. 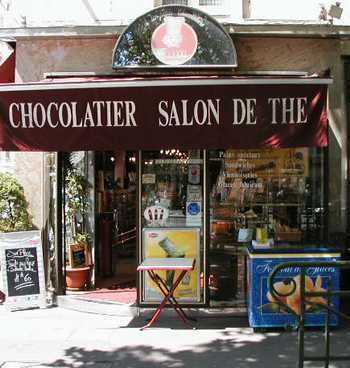 I did find one that has plain 66% pure dark chocolate bars on Avenue de la Motte Piquet (at left). This shop has a tea room upstairs that I’d like to try sometime on a rainy day. If it is nice outside, there are all sorts of wonderful places to have tea on an outdoor terrasse, just across the street from this shop. Tom and I went to one of those places, Oh! Poivrier, for lunch yesterday. After a very satisfying salad (me) and sandwich (Tom), we didn’t feel like we needed to eat again that day. That reminds me of Deb’s theory, that one can eat less in France because one is so satisfied with the quality of the food, one isn’t left craving something more. I think she’s right. In addition to chocolate, foie gras is the next food that I love most about France. If I can have just a little foie gras and a salad for lunch, I am so happy. But we can’t always eat outside. We’ve had plenty of rain, including thunderstorms! On the average, it has been cooler than normal in Paris – a far cry from last year’s heat wave. Our friend Alan, the scientist, maintains that it was actually the air pollution (a by-product of the heat) that killed many of the older people. I think he’s right, based on what happened to my blood pressure last summer. “The French don’t like to talk about that very much,” he says. Our friend Kim writes to say that she’s doing much better with her French this year. She and her husband are in La Rochelle now, and will be in Paris in August. We find that we’re doing better, too. One of the things that has helped our listening comprehension is French in Action, a video course developed at Yale with support from the Annenberg Foundation. French in Action videos tell the story of a young couple, Mireille and Robert. Robert, an American who has a French mother, decides to come to France for a while to “find himself.” He stays in the Hotel Home Latin. 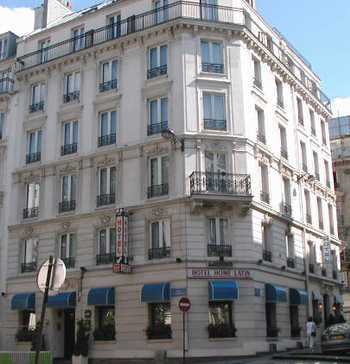 We were amazed to find this hotel on one of our walks in the 5th arrondissement (below left). So, it isn’t a fictional place, after all. When we go out for our walks, we often don’t take a map with us anymore. That works because I know my way around pretty well now, and Tom just follows me. But I told him that for our next walk, he’s going to navigate and lead. The freedom of walking out the door and walking for hours in a huge old city without need of a map is exhilarating. We got caught in a rainstorm as we returned from our walk in the 16th the other day. During the worst of it, we took shelter in an apartment building’s doorway. About every other day or so, we watch the Tour de France toward the end of the day, so we can see who wins that stage. It finally got interesting on Saturday when Lance Armstrong made his move, in the Pyrenees. I think it might be boring for the next couple days, until they get to the Alps. Sheryl Crow, Lance’s new rock star girlfriend, says she’s going to drag Lance along on her next punishing concert tour. She’s been following the Tour around in France. Also in the news is a lot of political bickering and backstabbing, as Nicolas Sarkozy gains popularity and seems to be aiming for the presidency of the UMP, the ruling, conservative party. The UMP needs something because in the most recent elections, the socialists made great gains. Chirac, however, is threatened by Sarkozy’s charisma and popularity, and tried to put Sarkozy in his place during the traditional Chirac TV interview following the Bastille Day parade.